This has been a banner year for Huawei. After launching the P20 series to great success and temporarily ousting Apple from the second place spot in the global smartphone market, the company wants to end a stellar year with a bang. Huawei’s finally taken the wraps off the Mate 20 and Mate 20 Pro, the latest entry in its most popular flagship line (and yet another addition to the #phonepocalypse ranks). What makes these new phones stand out? Here are the top five Huawei Mate 20 and Mate 20 Pro features. You’ve probably already decided how to feel about the notch. Love them or hate them, the controversial cutouts are popping up on more and more flagship phones. The Mate 20 brings two different styles of notch for its latest phones. The regular Mate 20 sports what Huawei calls a “dewdrop” design, which should be familiar to anyone who’s seen any recent phone from BBK-related OEMs. Meanwhile, the Mate 20 Pro features the wider, rectangular notch design we’ve seen become the standard over the past year. While the Mate 20 Pro’s larger notch also brings a front-facing sensor array (more on that later), Huawei is at least giving consumers a choice of what type of notch they prefer aesthetically between the two phones. Featured heavily in pre-release promotional materials, the Mate 20 series’ square-shaped camera unit won’t be to everyone’s tastes, but it certainly makes the phones stand out. 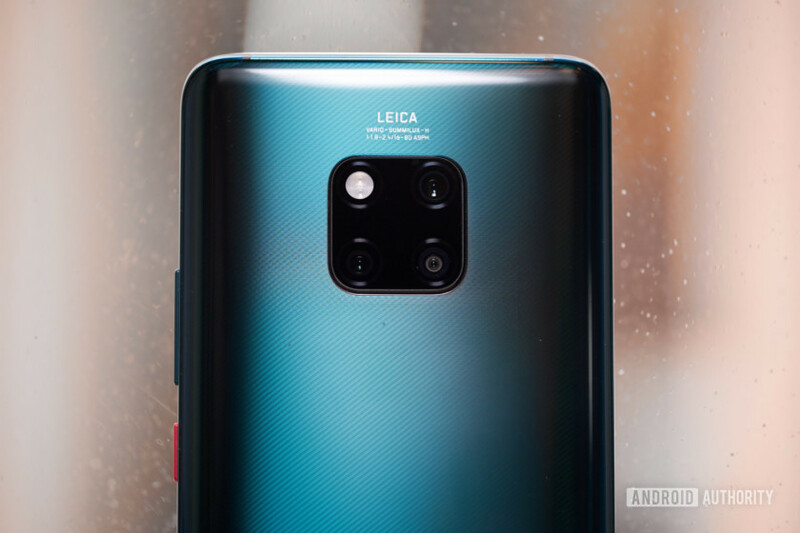 As for the lenses themselves, the Mate 20 Pro’s module houses an 8MP 3x telephoto sensor with OIS and a f/2.4 aperture, a 40MP primary sensor with a f/1.8 aperture, and a 20MP ultra-wide sensor with a f/2.2 aperture and 16mm focal length equivalent. The standard Mate 20 camera package isn’t quite as enticing, but it still packs a respectable 12MP primary f/1.8 sensor (replacing the 40MP on the Pro), a 16MP wide-angle sensor with a f/2.2 aperture, and an 8MP telephoto sensor (f/2.4). Move over Kirin 970, there’s a new HiSilicon SoC in town, and it’s the most powerful chipset from Huawei to date. The Mate 20 and Mate 20 Pro are the first phones to be powered by the Kirin 980 SoC, which was revealed back in August. Based on the 7nm process and outfitted with Arm’s latest high-performance Cortex-A76 cores and four lower power Cortex-A55 cores, the Kirin 980 is a beast on paper, and Huawei says the real-world results are equally impressive. Backed by 4 to 6GB of RAM on the Mate 20 and 6 to 8GB of RAM on the Mate 20 Pro, the Shenzhen-based firm claims CPU performance is up 75 percent over the Mate 10 series, with power efficiency also increased by 58 percent. There’s also the Dual NPU, which boosts the camera’s object recognition and real-time image processing capabilities. Huawei says the additional NPU makes the Mate 20 capable of recognizing a whopping 4,500 images per minute. Packed inside the Mate 20 Pro’s larger notch is a 24MP RGB sensor, a dot projector, a TOF proximity sensor, a flood illuminator, and an IR camera. The 24MP camera will no doubt appeal to selfie lovers, but the real highlight here is how it combines with the other sensors for the phone’s face unlocking system. The feature is heavily based in biometric hardware, instead of the Mate 10 Pro’s tacked-on face unlock. Huawei says it’s at least 30 percent faster. The sensor array also won’t fall foul of the old photo-of-your-face trick, as it’ll only play ball with a 3D subject. Again, the standard Mate 20 gets a little shafted here. The vanilla model not only misses out on the advanced face unlocking, but also has to settle for a regular fingerprint sensor on the rear of the phone beneath the camera module, as opposed to the in-display reader on the Mate 20 Pro. Whether buying the Mate 20 or the Mate 20 Pro, you’re getting some serious bang for your buck in the battery department. The Mate 20 packs a 4,000mAh cell much like its predecessor, and the Mate 20 Pro enjoys a slight bump up to 4,200mAh. That’s not the only upgrade the Mate 20 Pro is getting however. The phone also features the latest version of Huawei’s Supercharge tech, which now outputs at 40W. The company says this enables fast charging that can take the phone from 0 to 70 percent in just 30 minutes. Likewise, while both Mate 20 models support 15W wireless charging (apparently twice as fast as the iPhone X), the Mate 20 Pro gets something a little extra: reverse charging. You’ll be able to use your phone to wirelessly charge any other Qi-enabled gadget. So those are our top five Huawei Mate 20 features, but there’s so much more to the Mate 20 and Mate 20 Pro. We haven’t even talked about the stunning display, the gorgeous glass body, the huge range of colors (including the new Hyper Optical Display Pattern), or the software improvements with EMUI 9.0. No matter which Mate 20 you choose, you're getting a lot of bang for your buck. For more on the Huawei Mate 20 series be sure to hit the links below. We’ll be putting the phone through its paces for review very soon. For now, let us know what your favorite Mate 20 or Mate 20 Pro features are in the comments.